Pope Francis: What Will the Next Year Be Like? Pope Francis ended 2017 with a Christmas address to the Curia composed of two parts. The first part included a sort of attack against those who exploited of the trust of Mother Church. The second part was concentrated on the “ad extra” work of the Roman Curia, with particular focus on papal diplomacy and ecumenical and interreligious dialogue. The speech did not grab as many headlines as the 2014 Christmas address did, when the Pope listed a series of Curia maladies. However, this last speech saw the completion of a transition. Last year, Pope Francis wanted to list all the Curia reforms he had undertaken during his pontificate. This year, the Pope completed his transition toward the classical type of Christmas address that popes normally deliver to the Curia, an occasion to review the guidelines of one’s government. On the one hand, this shows the progressive institutionalization slowly achieved by Pope Francis. On the other hand, it seems that the Pope became aware of the need to clarify some ideas, in view of unavoidable attacks from the inside. The theme taken up by the Pope’s enemies is very much on point. The Pope’s enemies are always described as averse to his reform. The finger is pointed at the so-called “traditionalists,” as if defending traditional Catholic teaching was a demerit. Terms such as “revolution” or “the Pope Francis effect” are exploited in order to generate expectations and to create a chasm between the Pope, his reforms, those who support these reforms and, on the other side, all the others. It is certain that this polarized debate will continue. This is the reason a more in-depth analysis of the facts is needed in order to understand clearly what is going on. For instance, the attack against Cardinal Oscar Andrés Rodriguez Maradiaga on the mismanagement of funds from the Catholic University of Honduras is the first example of an upcoming gang war. This gang war is being carried on among people who are working on Pope Francis’s reforms. It is not a consequence of attacks from the outside. Cardinal Rodriguez Maradiaga strenuously defended himself against all the accusations, and above all, he strongly defended his auxiliary bishop, Juan José Pineda, who is considered the real source of scandal – he is even accused of open homosexuality. At the same time, the Cardinal noted that the attack was made public only eight days before his 75th birthday, just one week before he reaches the age limit for all bishops, requiring that he tender his resignation to the Pope. However, this same attack had already surfaced in 2016 in Honduran circles. The real issue at stake is not the management of the archdiocese, and not even an attack against Pope Francis’s reforms. 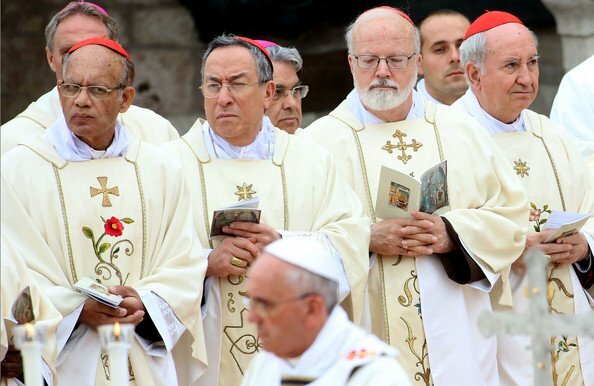 The real issue seems to be the possible renewal of the Council of Cardinals that Rodriguez Maradiaga coordinates. In a book-length interview with the Salesian Fr. 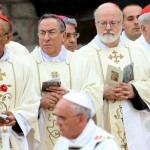 Antonio Carriero, the Cardinal emphasized that the members of the Council of Cardinals were not appointed on a life-term basis. The cardinal members of the Council were appointed in 2013. Following Cardinal Rodriguez Maradiaga’s rationale, the reshuffle of the Council should take place in 2018. A reshuffle is, however, needed. Cardinal George Pell, Prefect of the Secretariat for the Economy, cannot take part in the meetings since he returned to Australia in order to clear his name in the wake of an ugly campaign carried out against him. Cardinal Mosengwo Pasinya, Archbishop of Kinshasa, is already 78. Cardinal Rodriguez Maradiaga just turned 75, and while he can perhaps hold onto the post of Archbishop of Tegucigalpa for two more years, he will certainly retire then. Behind the means through which the attack was carried out – the journalist who actually wrote the piece is one of the main characters in the second Vatileaks trial – one can see a push toward dismantling Pope Francis’s reform process. And this push might even come from within the ranks of Pope Francis’s collaborators. After the season of external consultants and the return of the consultants from within; after the season of the establishment of the Secretariats for the Economy and Communications, followed by the births of the dicasteries for Laity, Family and Life and for the Promotion of Integral Human Development; after the gradual reshuffle of the College of Cardinals, which should now be halted for at least one year, since the limit of 120 voting cardinals in a conclave has now been reached; after the huge process of debate over the post-synodal apostolic exhortation, “Amoris Laetitia,” which generated strenuous controversy involving both the right and the left; after all of this, those who have seen in Pope Francis a possible promotor of a deep reform of the Church are expecting from him a major institutional commitment. To cut it short, they are looking for something that is more of the “reform made while walking” and of the “opening of processes” that Pope Francis preached in “Evangelii Gaudium”. Something that will continue even during the next pontificate. Next year the debate will be focused on this point. It will not just be a debate between traditionalists and progressives. It will involve a discussion about the future of the Church, and it will need better tools than the gang war going on up till now. In the end, a gang war works when it is aimed at dismantling a system, not when aimed at building a new one. Looking back to the attacks against Cardinal Rodriguez Maradiaga, two issues come to mind. The first is that, in the end, the real problem of the Cardinal is that he trusts too many of his collaborators even when they prove themselves unfaithful or unfit for their posts, even if this is due solely to their ideological issues. Cardinal Tarcisio Bertone, another Salesian who served as Pope Benedict XVI’s Secretary of State, had the same problem. However, Cardinal Bertone was crucified for mistakes in choosing his collaborators, along with his naiveté in managing certain situations. No one wants to justify mistakes, and history will tell if Bertone made real mistakes or simply trusted others too much. This is, however, the general framework for his situation. Though he finds himself in a similar situation, Cardinal Rodriguez Maradiaga earns media trust. Nevertheless, it is surprising that a leftist magazine, started by the founder of the Italian leftist newspaper, “La Repubblica”, a man who was one of the first to interview Pope Francis, is targeting a cardinal from among the Pope’s inner circle. Was not Pope Francis the idol of the progressive and secular press? The truth is that no one in the secular press defends the Pope because of his allegedly open positions. Instead, the press uses the Pope’s backing of those positions to pursue its own agenda. This is another main theme of this pontificate. Cardinal Rodriguez Maradiaga already distinguished himself some time ago by offering a resolute defense of one of his collaborators. This happened when the Cardinal was President of Caritas Internationalis, and Lesley-Anne Knight, then Secretary-General of the body, was involved in a scandal. Knight was attacked for including non-Catholic and pro-choice groups under the Caritas umbrella. She then asked not to be candidate for a second term, because of the need to give Caritas Internationalis a stronger Catholic identity. This led, and not by chance, to the reform of the statutes of Caritas Internationalis, as part of the great reform of Vatican charities that Pope Benedict started and Pope Francis carried on. Knight re-entered the Vatican as Secretary of The Elders Foundation, chaired by Kofi Annan, when members of the Foundation met with Pope Francis in a private audience on the eve of the Pope’s trip to Myanmar. Knight’s presence in the Vatican closed the circle that ideologically rehabilitated the way Cardinal Rodriguez Maradiaga had managed Caritas Internationalis. The first ring of this circle was Pope Francis’s rapprochement with popular movements. Meeting with popular movements, Pope Francis in the end encountered the social forums. And meeting the social forums can be considered a sort of response to critics against the involvement of Caritas Internationalis with meetings of the social forums. Can we say, in the end, that this fifth year saw these ideological run full circle? Under Pope Benedict XVI, there were complaints among those who felt marginalized, or saw his moves as “steps in reverse.” The fact that Benedict set the tone of his pontificate on the issue of the truth, from the perspectives both of diplomacy and conflict management, as well as in the perception of history (his first Christmas address to the Curia — on the hermeneutic of discontinuity in interpreting the Second Vatican Council — is still memorable) was a shock for those who backed the agenda to change the Church’s doctrine. The choice of Cardinal Bertone as Secretary of State, a non-diplomat coming from the ranks of the Congregation for the Doctrine of the Faith, produced some discontent within the ranks of papal diplomats. So, the Pope was given four years to carry out a specific agenda. De facto, Pope Francis proved to be freer than his electors, and remained firmly committed to his own ideas. The real challenge, for the fifth year of his pontificate, is to preserve the unity of the Church. But doing so will be a complicated affair. A hidden schism has been talked about for years. And the schism has its origins mostly on the progressive side, one based on the notions of discernment and conscience, allowing the faithful to live the faith in their own way, without regard for any particular doctrinal issue. When schism occurs on the right, it does so historically as the result of a traditionalism which is fed by local Churches who claim a greater autonomy from Rome – for example, the kind of Lefebvrism which grows out of Gallicanist movements. Preserving the Church’s unity is a big challenge for this Latin American Pope, because Latin America currently cries out for greater local autonomy. Will the Pope be able to overcome division by simply certifying the redemption of Latin American theology? Will this provoke some disappointment among his Latin American brethren? Will this redemption of Latin American theology be really useful to the Church as it seeks to gain a more global vision, without fostering a theological division between sons and sons-in-law? Will we see a global cultural project to shape the Church’s unity? These are the open questions for 2018. There is one idea lurking beneath all of this: Pope Francis’s pontificate is a necessary transition, a switch in the balance that should lead to a new center, beyond any progressive-conservative dialectic. The match will then be played during the next pontificate. 2018 will present Pope Francis with difficulties inside the Curia. This is the reason the Christmas address was mostly focused on the outside, toward papal diplomacy and that ecumenical dialogue which represents this pontificate’s real frontlines. At least for now.